Nested, handles up: 16 x 13 7/8 x 13 7/8 in. No basket form is more tied to place than the Nantucket lightship basket. While many functional baskets from the 1800s were made with thick, wide staves and sturdy enough to carry potatoes, the Nantucket lightship basket has evolved into a fine craft. Basket maker Karol Lindquist apprenticed with Reggie Reed, who descended from some of the island's earliest basket makers. The scrimshaw on the handle, done by Karol's husband Robert Frazier, features a lightship - the floating lighthouse where crewmembers first made this kind of basket. 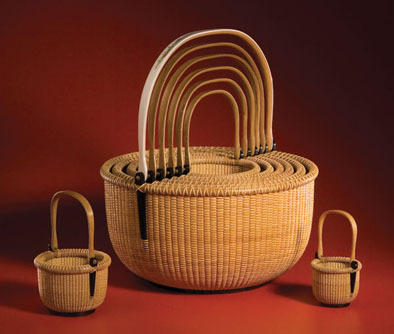 The name "lightship basket" derives from baskets made on vessels like the one pictured above. In 1854, the United States Lighthouse Service commissioned this ship as a floating lighthouse. Anchored 24 miles off the southeast coast of Nantucket, her powerful light warned ships away from hazardous shoals in an area nicknamed "the graveyard of the Atlantic." For many years, the Lightship's crew consisted entirely of Nantucket men. They battled boredom between chores on their lonely outpost by spending their leisure time at handicrafts, including scrimshanding, carving, and basketry.